This article marks the start of a new food column by Raffles Press. We will highlight eating places close to RI, and hope to broaden the food options of Rafflesians. From mouth-watering, crispy fried bananas to richly flavoured prawn soup, Longhouse Food Centre at 183 Upper Thomson Road was a treat for the taste buds as it offered a variety of traditional Singapore hawker-style foods. For our journalists, enough was enough – the trips to air-conditioned, fast-food eateries in Junction 8 have just been one too many. Far from the Subways and Pizza Huts of the world, we instead ventured to the foreign territories of Upper Thomson Road, namely the Longhouse food centre, a quaint hawker centre situated in the midst of a busy traffic junction. If one is familiar with the Prata House, popular as it is amongst the RI crowd with lunch breaks to fill, the trip to Longhouse would not be something completely alien: hop into the 410 from school, and get off the stop after the Shunfu Market (the stop before the Prata House bus stop). We were at first a little apprehensive about the maze-like routes: Longhouse Food Centre was not within sight when we initially got off at the bus stop, but after a little manuveuring, we eventually made our way there. From the moment we entered, the whiff of the different dishes filled the air, and we could tell that this was a popular eating place – it was crowded with cars coming and going in its carpark, though we managed to get a seat for five fairly quickly. Though the eatery was not air-conditioned, it was well-ventilated with many fans that seemed to blow some sort of water vapour mist, making it quite cooling, and hence the lack of air-conditioning was barely noticeable. However, our visit was at 7pm at night, so we cannot speak for what the blazing lunch time temperatures of Singapore might do for students going there for lunch. Dinner was a small-scale yet interesting affair, as each member selected a dish of their liking and shared it amongst the group. Our choices ranged from delightful snacks such as popiah to larger meals like chicken chop, and every arrival of a dish brought much delight amongst all members. 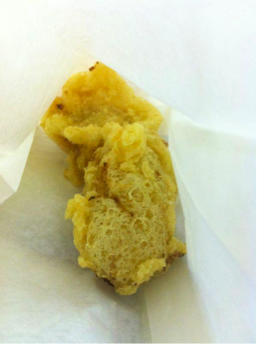 However, there was a snack that was on the priority lists for everyone – the famous Boon’s Goreng Pisang. A quick Google search brings up many hits for this famous shop, and we quickly dispatched a member to do the purchasing, given that the only have a limited supply of crisp-fried bananas everyday (there were only about 10-20 left by 7pm). Bananas in hand, the members took their bites. Immediately we were overwhelmed by the blend of the sweetness of the banana and the crispiness of the crust. The softness of the inside complemented the slightly salty crispy coating on the outside. Though the fried oily pleasure is hardly something recommended for the health-conscious, those concerned about their wallets need not worry, as one costs between $0.80 – $1.20, depending on the size of the banana. It is definitely a treat that keeps you coming back for seconds. We then targeted the next item on the table: Prawn Mee. 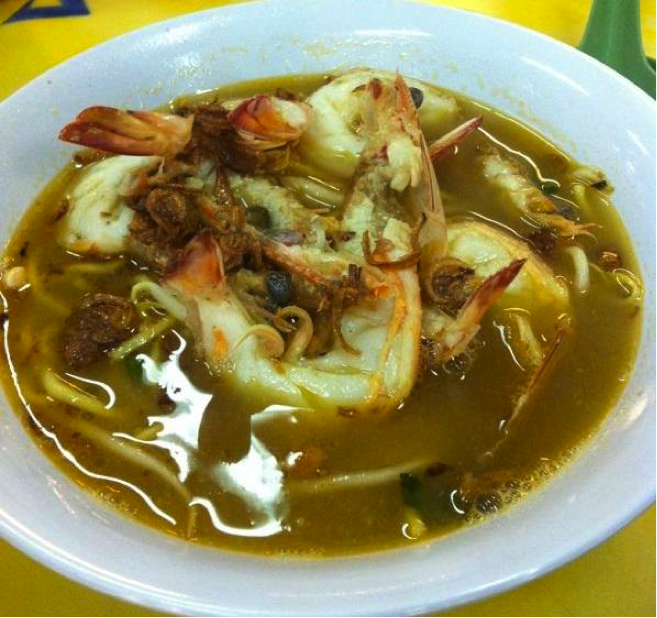 This prawn mee is well-known online and has many positive reviews on food websites. At $5, this dish might appear a little expensive at first glance, but its subsequent arrival changed our opinion immediately. The prawn mee was stocked with an abundant supply of ingredients, including 6 pieces of prawn sliced into half. Taking a sip, the first taster gave a murmur of approval, and soon everyone dipped their spoons in to get a taste of the soup. There was a delectable layering of flavours in the soup. A hint of garlic contributed to a rich overall texture, and the taste of the prawn blended in to give the soup that was packed with goodness. The noodles and prawns, however, did not stand out in the dish. One thing worth mentioning is the effort taken by the stall owners in preparing the food: presentation was done with much care, and the prawns were sliced to allow easy removal of the prawn shells without having to use one’s hands. Next, we turned our attention to the duck rice, which was a dish that tasted as interesting as it looked. The fame of this duck rice stall is evident as the food buffs amongst us shared their knowledge of having heard its name at least once online. Carefully spooning some duck rice into our mouths, we were immensely delighted at how flavourful the rice was. There is no need to add chilli or any other sauce. The other highlight was the duck meat, which was tender, succulent, and well-marinated. An even greater piece of news is that it is priced at an affordable price of $3.50, which will probably be a relief to students on a budget. The only downside is that there is a lack of vegetables in the dish, and students who take delight in munching on cucumber slices every time they go for chicken rice will probably find this small serving of vegetables inadequate. Though not as renowned on the internet or outstanding in terms of taste, the Western food stall is definitely worth a mention because of its large servings and high value for money. 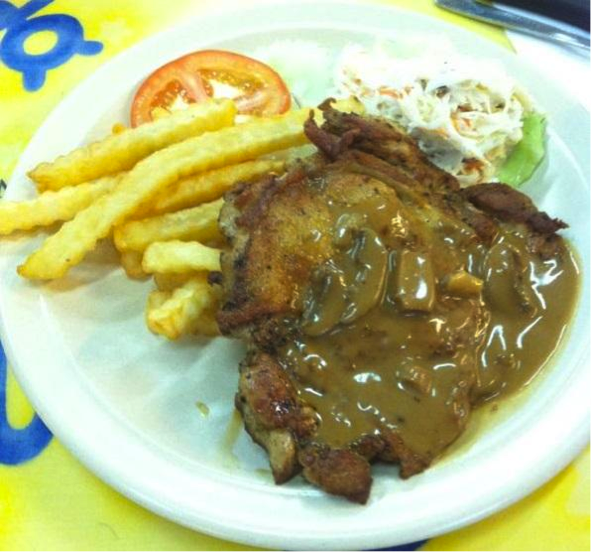 At $5.50 for a humongous portion of chicken chop, the price is average and even included tasty soup. The stall also had many other options to try including Lamb Chop and Sirloin Steak, and offered plenty of delicious prospects for return visits. 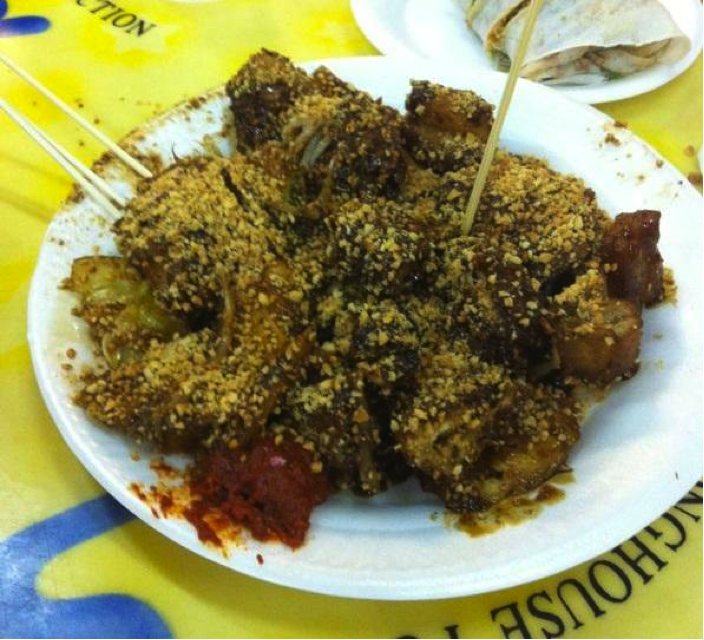 We also tried the rojak ($3-5), which was something nice to top up the meal, though nothing spectacular. It also took 15-20 minutes to arrive. 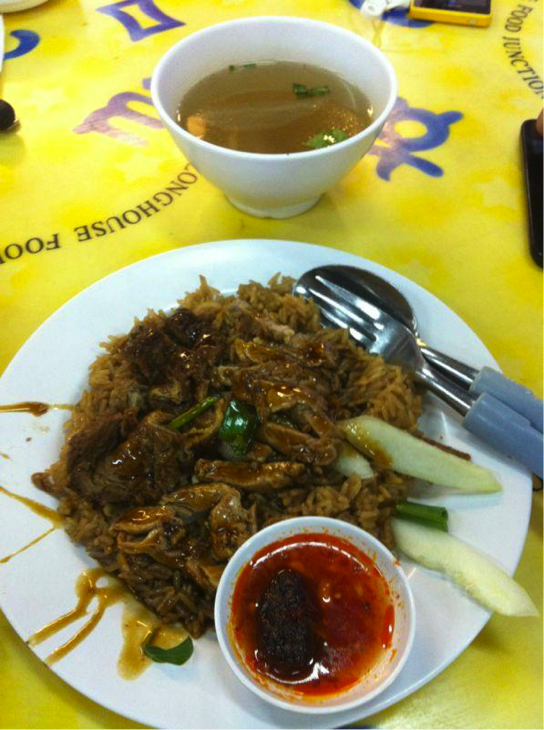 Similarly, the popiah, fish soup, and hokkien mee were of average quality. All in all, we wholeheartedly recommend a trip down to Longhouse – it may be a little out of the way, but it definitely has a whole new variety of foods to try other than the familiar haunts of RI students and the dreary canteen. It may take a little time finding, but it makes for a fun new trip for the adventurous. We most definitely will be back again to try the Thai food stall, or possibly even the interesting desserts like Dragonfruit Jelly that we were too stuffed to try by the end of this eating expedition. With two years worth of lunches to fill, Longhouse is definitely a place that RI students can visit quite a few times to get something new each time. 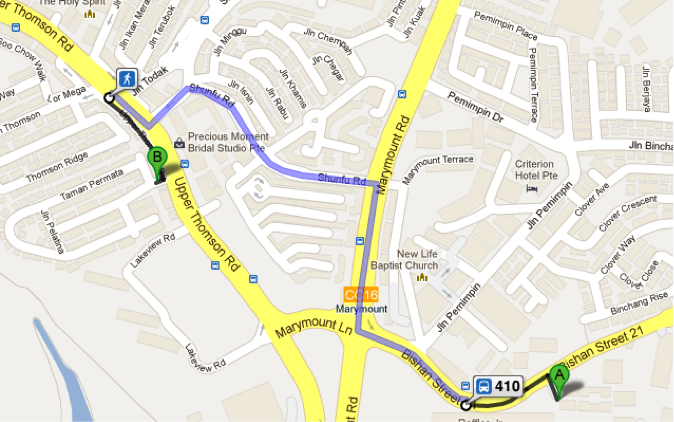 Take 410 from canteen bus stop; get off 2/3 stops later and walk to Longhouse. The impassioned cheers from the crowd are abruptly silenced as the fencers raised their sabres. A pause. Everyone is frozen in their places, eyes focused on the two glinting weapons. They clash. PISANG GORENG. Get it right. gosh. sadly they closed down already in September 2014. Would go there frequently for dinner on Sundays in 2013. going to miss it alot!